TP-Link smart devices are an easy way to get your feet wet in the smart home world. Smart plugs and smart bulbs are easy to install and easy to use. They’re also easy to uninstall and send back if they’re not what you’re looking for. Since there’s not much that can go wrong, there’s not much to fear. 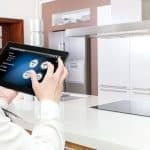 The TP-Link suite of connected devices is constantly growing. It consists of consists of smart plugs, switches, and lights. I have had the opportunity to test the smart plugs (HS100) and smart lights (LB110) in my home for the past 2 months. I’ve used them with my Amazon Echo Dot. I set the lights to turn on when my morning alarm goes off. I used the smart plug to control my living room lights and my Christmas tree lights and my humidifier. I have turned them on and off a few hundred times in the 2 months we’ve been using them. They are relatively simple devices (compared to something like a smart thermostat) so there isn’t a lot that can go wrong. 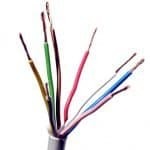 Nevertheless, I’ve been impressed with their reliable connectivity and responsiveness. 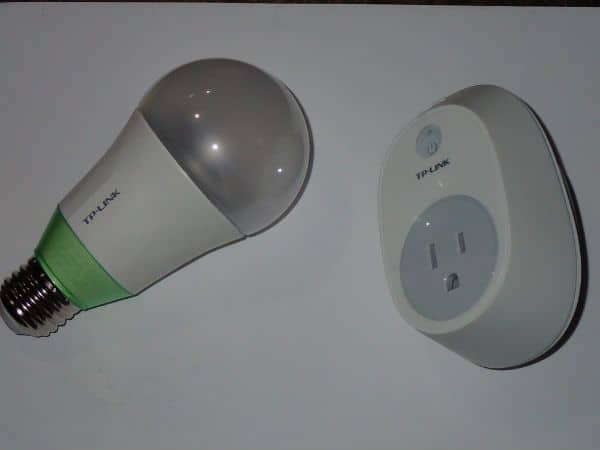 I’ve been using a TP-Link LB110 Smart Bulb and HS100 Smart Plug for the past two months. I’ll start by talking about some features that are shared by all TP-Link smart Wi-Fi devices and the app you’ll use to control them. Then, I’ll get into a little more detail about the smart plug and smart light I used and the unique features of both. 1 How Do I Get Started With TP-Link? 2 Are The TP-Link Devices reliable? 3 What’s The TP-Link Kasa App? 5 When Is IFTTT Coming? How Do I Get Started With TP-Link? First download the Kasa app, then just follow the simple onscreen directions to connect each device. The TP-Link devices are really easy to setup. These gadgets will connect directly to your home WiFi router. That means you don’t have to deal with the extra hassle and cost of setting up a hub. A common problem is using the wrong WiFi band. TP-Link devices will only connect to the 2.4gHz band. My home router is a dual band router. It broadcasts a signal on both the 2.4gHz and 5gHz band. When I initially connected my devices, I found that my phone also had to be connected to the 2.4gHz band. However, after the initial setup, I have been able to keep my phone connected to the 5gHz band and still control the TP-Link devices without any problem. Are The TP-Link Devices reliable? First, the reaction time of the devices is basically instant. The time from when you press the button on the app to when the device turns on/off can’t be more than a few milliseconds. This is really important. Even a delay as small as 1-2 seconds can be a major annoyance if you’re turning on a light. Next, the connectivity of the devices has been really good. I’ve been using them for about two months and there were only one or two times that the app couldn’t connect to the devices. When that happened, I just restarted the app and everything worked again. The TP-Link devices can also be controlled remotely via the Kasa app. What I mean is, your mobile device doesn’t have to be connected to your WiFi router. However, I’ve found that this doesn’t work perfectly. If I leave my home and disconnect from my home WiFi, the Kasa app opens and looks like it’s going to work, but it doesn’t. It hesitates for a few seconds before saying it can’t connect to the device right now. In order to make it work, I just have to restart the app. Then, I can control my TP-Link devices from anywhere. What’s The TP-Link Kasa App? Kasa is the name of the app you will download and use to control your TP-Link smart WiFi devices. It allows you to link all your TP-Link devices together so they can be managed from one convenient location. 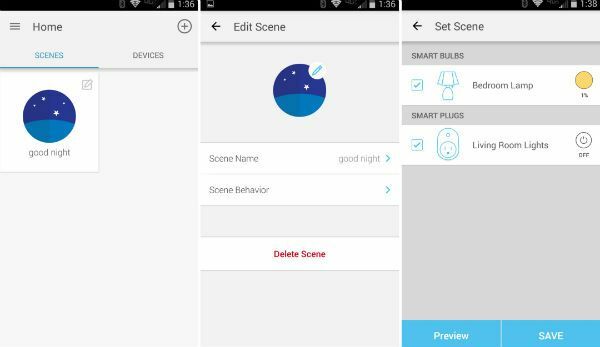 The Kasa app allows you to control multiple devices with one press by using “scenes”. For example, I created a scene called “good night” which turns off my living room lamps and turns on my bedroom lamp to 1%. My living room lamps are both connected to one smart plug and my bedroom lamp is a smart light. I press the “good night” scene button and a timer starts on the living room lights. After 5 minutes they shut off. At the same time, the bedtime scene turns on the bedroom lamp to 1% and starts a timer. After 10 minutes, the bedroom lamp shuts off. Maybe they’ll add that functionality in a future update. For now, I guess I’m stuck with on or off. When I first got the Tp-Link stuff, I was a little annoyed because every time I wanted to switch something on or off, I had to open the app and wait 4 or 5 seconds (yes, I know it’s basically an eternity) for it to load. But, I just found out that there is a handy Kasa widget that I can put on my phone’s home screen. The widget keeps your 4 most used scenes available right on your phone’s home screen. So, instead of having to open the app and wait the agonizing 4-5 seconds, you can just open your phone and tap the scene you want. Instructions on how to do this for iOS and Android are available inside the Kasa app (go to help/quick shortcuts to scenes). Amazon Echo is Amazon’s voice assistant that seems to be all the rage right now. The TP-Link devices support Amazon Echo. Pairing your TP-Link stuff with Echo is easy. First, enable the Kasa skill on your Echo. Then, go to your Alexa app and discover devices. Voice control is limited to basic on/off control except for lights which can also be set to specific intensities from 1-100%. 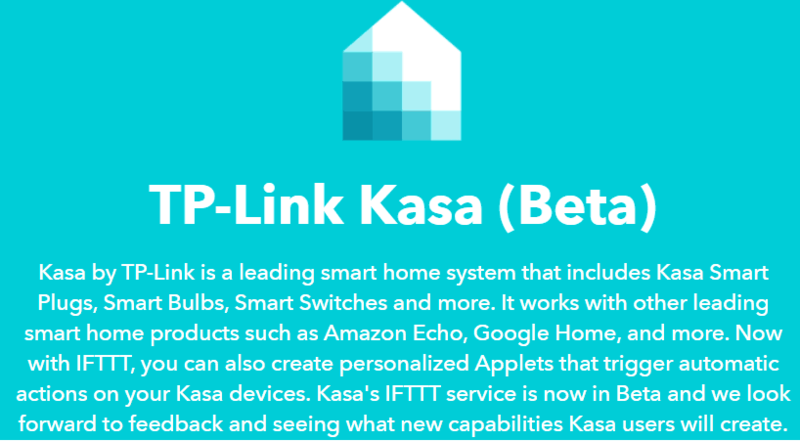 It’s been a long wait, but Kasa now has an IFTTT channel. It’s currently in beta, so there may still be few issues to work out. However, I have been using it with zero problems. The smart plug is a pretty simple device. It plugs into any standard outlet and then you plug whichever device you want to control into the smart plug. I tested the HS100. I have had my smart plug for over 2 months. So far, it has worked great. It’s a pretty simple device so not a lot can go wrong, but just in case it comes with a 2-year warranty. My first thought when I took it out of the box is that it’s big. On a standard outlet with two vertical receptacles, there is barely enough room to plug another cord into the bottom receptacle. If you plug the smart plug into the bottom receptacle the top half of the smart plug will cover the top receptacle. The HS110 leaves little to no room to use the other receptacle. TP-Link does offer a mini version (HS105) of the plug that will be more space efficient. The mini plug can be plugged into either receptacle and you will still be able to access the other. The smart plug allows you a few different methods for controlling it. You can set up a schedule by adding specific times to turn on and off. You can also tell Kasa to repeat those commands for specific days of the week. 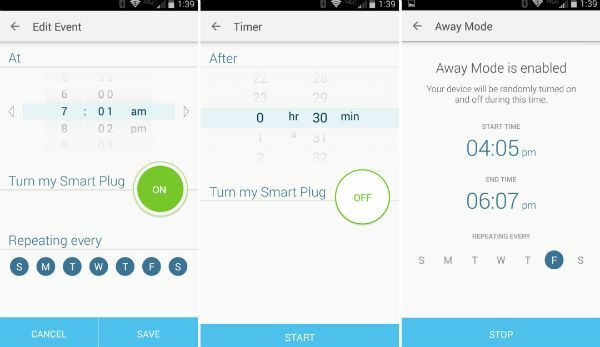 Another option available for the smart plugs is to use timers. You can tell the plug to turn on/off after anywhere from 0-24 hours. A third option is to use what they call “away” mode. You might want to use this if you go on vacation and you want to make it look like someone might be home. The “away” mode will randomly turn your smart plug (and whatever is plugged into it) on and off during the period you have scheduled for “away”. Set up schedules, timers, and away mode. You can name the smart plug whatever you like in the Kasa app. If you have an Amazon Echo, you’ll be able to use that name to control it. For example, if you name it “smart plug”, you can say, “Alexa, turn on ‘smart plug’” or Alexa, turn off ‘smart plug’”. Since I’ve had my smart plug, I’ve used it for 3 different purposes. First, I used it for my Christmas lights. The plugin for the lights is hidden behind the Christmas tree and some nearby shelving so bending over to manually plug/unplug lights is a real pain. Adding the smart plug eliminated that inconvenience and as a bonus added the ability to put my lights on a timer. Next, I set it up with my living room lamps. I have two small shelf lamps and one large floor lamp to light my living room. Normally turning them all on/off requires walking around and flipping 3 switches. I plugged the two shelf lamps into the smart plug and replaced the bulb in the floor lamp with my smart bulb. Then, I used the Kasa app to turn them all on or off with one press. Right now I’m using it for my countertop Scentsy. Before the smart plug, the Scentsy was always getting left on all day and night and the house would just get filled with intense aroma for a day or two. After that, the smelly stuff would be pretty much gone and the wax would have to be replaced. 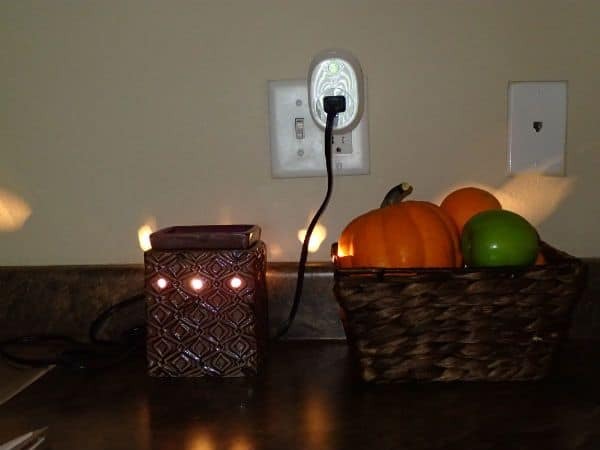 I am using the smart plug to automatically schedule the Scentsy for only 2-3 hour periods when we are most likely to need some air freshening. My TP-Link smart plug and Scentsy keep my kitchen smelling nice! The smart bulbs screw into any standard A19 light socket. The LED light and WiFi module are completely enclosed within the bulb. Some models are able to change color temperature and others can even change their color. TP-Link has a number of different available bulbs to make sure there’s something for everyone. I tested the LB110. It’s a dimmable smart bulb which means it can adjust its brightness. It cannot adjust its color temperature or hue. In order to do that you have to get either the LB120 or LB130 respectively. 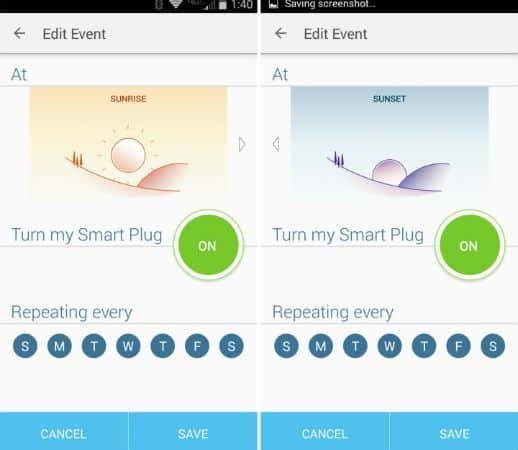 You can set up a schedule just the same as with the smart plugs. However instead of only turning the bulb on or off you can also set the intensity. The light intensity is adjustable from 1-100%. At 100% it puts out 800 lumens, which is roughly equivalent to a 60W incandescent bulb. You can adjust the intensity using a slider on the app or by an Alexa command. You can also schedule the smart bulb to use the local sunrise/sunset times to turn on and off. Schedule events by using your local sunrise or sunset time. 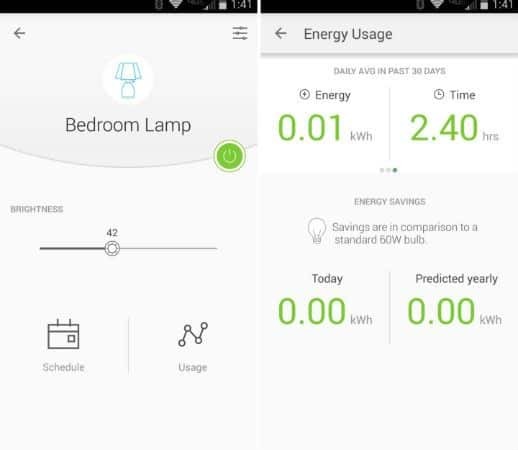 The app lets you view the bulb’s energy usage and shows you how much energy you’ve saved versus an equivalent 60W incandescent bulb. Use the app to adjust the bulb’s brightness with the slider or check on its energy usage. 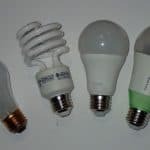 The price of a smart bulb may seem a bit outrageous at first, but if you take into account the energy savings and long life of LED bulbs, you may find that LEDs are cheaper in the long term. The bulb is still fairly bright even at it’s lowest setting of 1%. A few minutes before my alarm goes off in the morning, I have my smart bulb set to turn on to 1%. The light is bright enough to sometimes wake me up, especially if I happen to be facing the light. I haven’t done a side-by-side comparison, but I would guess the brightness on its lowest setting is roughly equivalent to a 15W incandescent bulb. 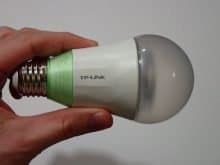 This problem of limited dimming isn’t unique to the TP-Link bulbs. It’s more a limitation of LED bulbs and the science behind how they work. If you keep turning down the power on an LED bulb, the light will get dimmer to a point. But, after a certain threshold, the light will shut off completely. Incandescent bulbs work better for dimming if you want to get really dim. If you’ve ever used a dimmer switch with an incandescent light bulb, you know that you can just keep turning down the power until all you see is a dim red glow of the filament. One feature that I would like to see added is the ability to tell the light to slowly turn on or off over a period of time. For example, when I wake up in the morning, I would like the light to turn the light on to 1% 10 minutes before my alarm. Then over that period of 10 minutes, increase in intensity until it’s at 100% by the time my alarm goes off. Right now, there’s no simple way to do this. However, you can do it by manually scheduling each intensity change over the period you want, but it’s quite tedious. 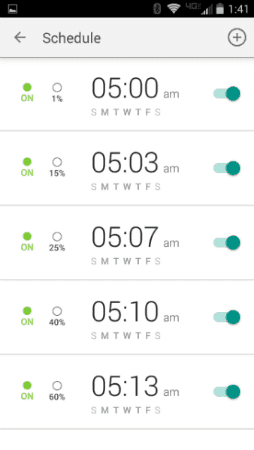 Plus, if you decide to set your alarm a half hour later one day, you’ll have to redo your whole light wake up schedule. Setting up a “wake-up” sequence is tedious and not easily adjustable. The TP-Link smart WiFi devices allow you to turn ordinary electronic things into smart things. Whether it’s a lamp, Christmas lights, or a coffee maker, you can use the Kasa app and the TP-Link smart devices to schedule more convenience in your life. The Kasa app is stable and easy to use. The devices are responsive and reliable. There are a lot of options out there for smart plugs and smart bulbs. I haven’t tried them all so I can’t say for sure that TP-Link is best. But, I can say that I’ve enjoyed using them over the past couple months and wouldn’t have a problem recommending them to a friend. Did you enjoy my article? Did you hate it? I love getting comments and questions from my readers so please let me know in the comments below! Scenes do work with Alexa, but it’s up to the 3rd party application (in this case, Kasa) to create the integration. As far as I can tell, they have not done that yet and I’m not sure that they will anytime soon. They STILL don’t even have IFTTT done. However, you can create groups with the Alexa app and TP-LINK devices. That will allow you to turn all devices in the group on or off which can be useful for grouping lights together. But, this isn’t as nice as scenes which would allow you to set custom settings for each device. Actually, it is very easy to get ‘scenes’ – or groups of lights to work using Alexa – simply create a ‘group’ in Alexa (in the Smart Home section). You can create multiple groups and the devices in the group do not all have to be the same brand. For example I have a group called “kitchen’ – it controls 6 TP-LINK LB110, 1 WEMO smart plug and a pair of LFIX BR30 bulbs. You are correct. However, the problem with Alexa groups is that you can only apply one action to all the items in the group. For example, you can either turn all lights on or all lights off. With the Kasa scenes, you can mix it up if you want. For example, I have a scene called “bed time” where I have the living room lights turn off and the bedroom lights turn on all with one button press. Great! Thanks for the update. I’ll make sure to check it out and update the article. I haven’t tried TP Link’s smart bulbs as yet but found their smart plugs to be quite reliable. I think the Kasa HS300 smart power strip is one of the best on the market, even though it’s slightly pricier than average.